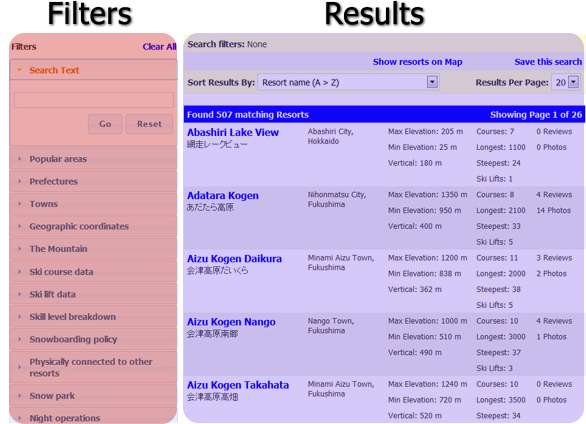 Our new powerful search tool lets you perform very detailed searches of all of the ski and snowboard resorts in Japan. We hope that you will find it to be a useful tool to help discover resorts that interest you, and also simply a lot of fun. Say you wanted to find all of the ski resorts in Niigata Prefecture that have a minimum elevation of over 600m, a longest course of over 3000m, a steepest course gradient of over 35 degrees and more than 3 quad lifts. And you wanted to view the results sorted by longest course. Or perhaps you wanted to find all of the ski resorts in the Hakuba area of Nagano and the Niseko area of Hokkaido that have a gondola or ropeway, more than 15 courses and more than 30% of courses were for beginners... sorted by the total number of ski lifts at the resulting resorts. Those are just a few random examples of the kind of information that you can very easily find - literally within seconds. You can view all of your search results as a list sorted by over 10 criteria or alternatively view the resorts plotted on a map of Japan. If you are logged into MySnowJapan, you can also save your searches. We will be actively developing and fine-tuning this new search functionality further over the coming months. As with any new code of this complexity, there's always a good chance of there being some bugs that need fixing up. If you feel that you have found an issue, please do contact us - feedback will help us continue to improve this tool. The best way to get to know this new tool is to spend some time playing about with it and getting used to how it works. Here's one example that will get you started. Use the 'filters' on the left side of the page to begin your search. Choose an option or move a slider and the results, displayed on the right side of the page, will adjust accordingly. Click on the Prefectures filter. You should see a list of prefectures appear. Click on Nagano. After a second or so of thinking, you should see the results on the right side of the page change. It is now showing you all of the ski and snowboard resorts in Nagano Prefecture. Let's sort these results. Choose Maximum elevation (highest > lowest) in the top Sort Results By drop down menu. The list of resorts will adjust to show you all of the resorts in Nagano Prefecture, but sorted by the maximum elevation. Click the Towns filter on the left hand side of the page. You should see a list of towns appear. Note that the list only contains towns that are in Nagano Prefecture. That's because so far you have filtered Nagano Prefecture. Pretty cool, hey? Click on Hakuba. The results will once again adjust, while the sorting preference remains as it was previously. Want to see these ski resorts on a map? Click on the Show resorts on Map link at the top, and a map will appear showing the location of the resorts. Interested to know which of the resorts in Hakuba offers the most vertical? Easy! Choose Vertical (largest > smallest) from the Sort Results By dropdown. You'll notice that the results once again adjust to now show the resorts in Hakuba village, the resort with the largest vertical at the top. That's just one example of a simple search - you can go into much more depth than that. There's so many way to manipulate the data that we recommend you just get stuck in there and use it. Always remember that if you ever get lost deep in a complicated search and need to start again, just click on the Clear All at the top of the filters. That will reset them all and you can begin again.